Chief Palestinian negotiator Saeb Erekat said Monday evening following a meeting between Palestinian President Mahmoud Abbas and US special envoy George Mitchell that "the Palestinians made it clear to Mitchell that if the Israelis increase the settlements, raids of cities and assassinations during each of his visits to the region, this casts a serious doubt over the American peace efforts." The remark was made as the United States released an official statement saying that Israel and the Palestinians have agreed to launch indirect talks mediated by Mitchell. US Vice President Joe Biden, who landed in Israel on Monday afternoon, is expected to hold meetings with Israeli, Palestinian and Jordanian leaders in the coming days. 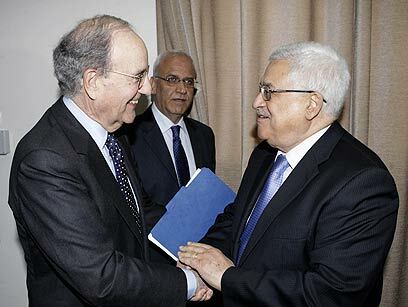 The Palestinians have agreed to resume the negotiations indirectly in principle, but have asked Mitchell for several clarifications and demanded that Israel stop embarrassing the Palestinian Authority with announcements on new construction plans in the West Bank. Erekat said that the settlement issue was the focus of Abbas and Mitchell's meeting, which lasted about five hours. During the meeting, the Palestinian president expressed his resentment over the Israeli declaration on 112 new housing units slated to be built in the settlement of Beitar Illit. Defense Ministry officials say the discussed plan was approved by the Olmert government. A Palestinian source told Ynet that the Palestinians were discouraged by the inefficiency of the talks and that the American pressure on Israel has led to nothing so far. He said that the Palestinians estimate that the negotiations are only damaging the Palestinian leadership's reliability, and that if the current round fails to lead to a real breakthrough – the feeling is that this will never happen. "Abu Mazen (Abbas) must emerge from this round of talks bolstered ahead of the Arab summit," the source explained. "The Americans must know that the Palestinians were seriously criticized at the Arab League's monitoring committee meeting. "Many delegations – mainly the Syrians, Qatari and even the Sudanese – raised questions and claims about the point in these negotiations, because they are leading nowhere in the meantime." See all talkbacks "Erekat: More settlements every US visit "